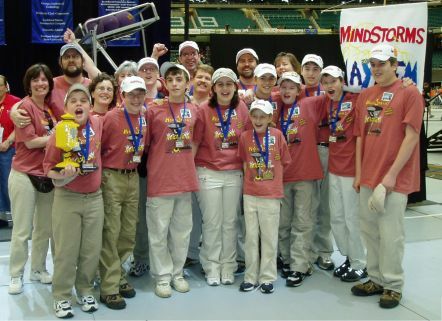 Mindstorms Mayhem - World Champions! at the 2004 International Competition in Atlanta, Georgia. Mindstorms Mayhem represented New Hampshire at the FLL Invitational Tournament April 15-17, 2004, in Atlanta, Georgia. In addition to winning the Director's Award, Mindstorms Mayhem, along with teams from Mississippi, Alaska, and North Carolina, won the Special Alliance Award.